The thumping beats of Dubstep and Trance blaring, the strobe and UV lighting glaring, the dark, mysterious corners … the team behind the revamped production of Yokes Night have certainly got the rave scene down to a T. Stay Up Late Collective bring this buzzing, hedonistic, whirlwind of a story to life. Putting drugs, destruction and disenchantment to the forefront, this energetic show chronicles the antics of the fuelled-up youth, on a thrilling night on the town. However, behind the pill popping, the snorting, the smoking and drinking, there are glimmers of vulnerability that makes you see things in a different light. 11th March 2015. Dublin. A botched loophole in the Irish laws means that for one night, and one night only, all drugs, including Class A, are legal. Consequently, the youth of the city are taking full advantage of this wondrous mistake. Seeing it as a chance to revolt and put a middle finger up to the bankers and the baby-boomers (who the young are blaming for getting everyone in such a sorry state), this night is certainly going to be one to remember. Following the anarchic movements of Harry and Saoirse on ‘Yokes Night’, their encounter leads to confessions and companionship, bound together in a synthetic euphoria, all with a little help from Dublin’s dealers. Written and performed by Scott Lyons, playing Harry, he gives a convincing turn as the excitable, care free, yet severely broke, youngster, who lives for the weekend. His infatuation with Saoirse (played with gumption by Niamh Finlay) is clear to understand. The vivacious, mouthy, college drop out stands out from the crowd with her fearlessness. Lyons captures the manic nature of drug-fuelled club nights, with both actors bouncing off the walls, quite literally. However, many a time this frenzied affair runs away with them, making it quite impossible to understand what is being said in their believable coked-up hyperactivity. Certain parts of the story feel they need beefing up further or explaining in more detail, but Lyons does do a great job at subtly underpinning the show with darker tones, highlighting more serious topics such as Ireland’s current abortion laws and the country’s financial difficulties. 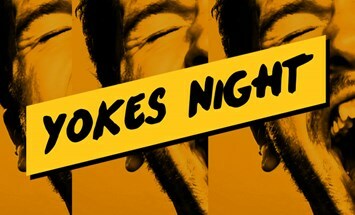 All in all, Yokes Night delivers a lively performance, full of vitality and youthful fecklessness, even if lacking in other indefinable qualities.